So the other day I had my Baking and Cooking class again. I made a pumpkin soup and one pumpkin was left over. What to do with it? A bit of brain storming at the office and I had my solution. Let me tell you, the husband was excited and loved it. I find cooking fairly simple and that you can do a lot of things with very few ingredients. This recipe as 3 to be precise. I recommend to use a Hokkaido pumpkin because you do not need to peal it. The skin gets soft during cooking/baking and you can eat it as is. Bacon, whatever you like to use, same with the potatoes. I used some from my good food box, they had a red skin. 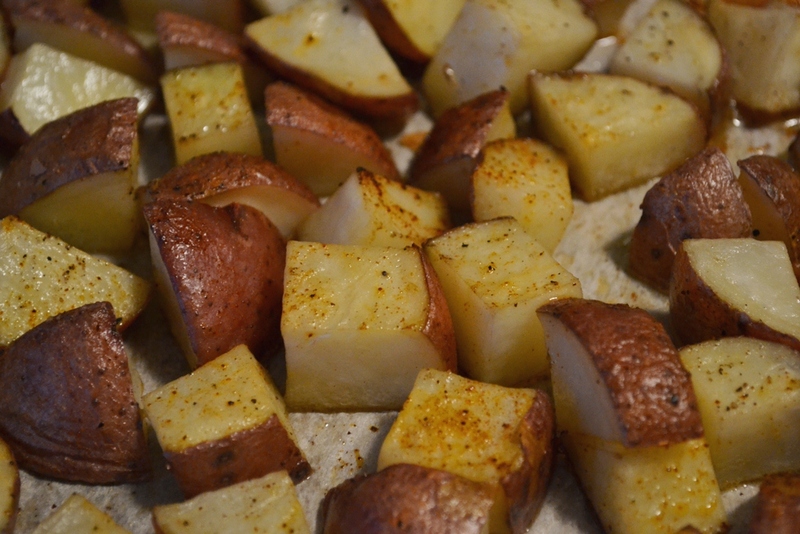 Wash and dice up the potatoes, the smaller the dices the faster it will cook. Leave the skin on because it gives it a bit of a crunch and vitamins and minerals are in the skin. *good for you* Place on a cookie sheet lined with parchment paper, drizzle with oil, sprinkle with salt, pepper, and paprika and toss them to coat equally. Time for the pumpkin’s big entrance. Cut of the ends and cut in half. 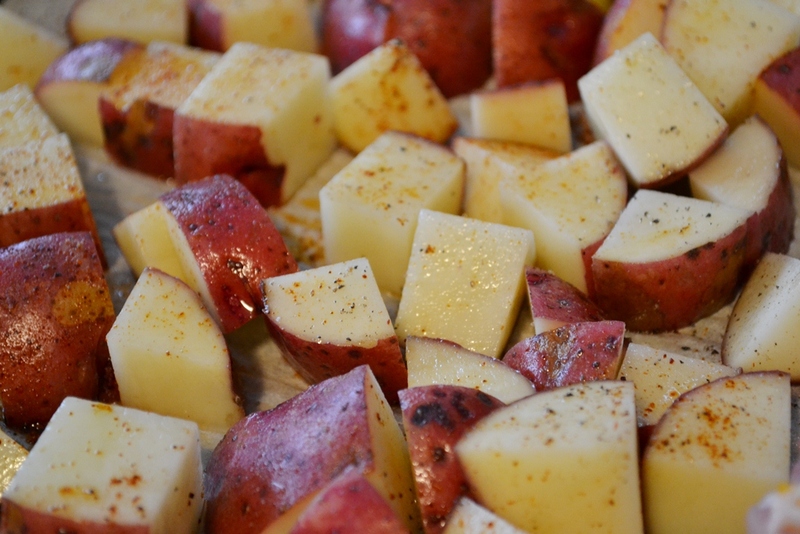 Remove the seeds and cut in wedges. 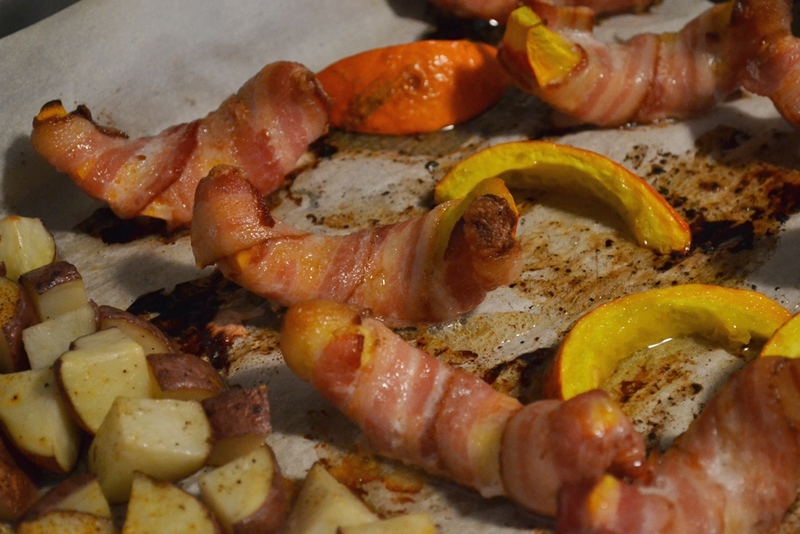 Then wrap them in bacon and place on the cookie sheet with the potatoes, besides them, not on them. 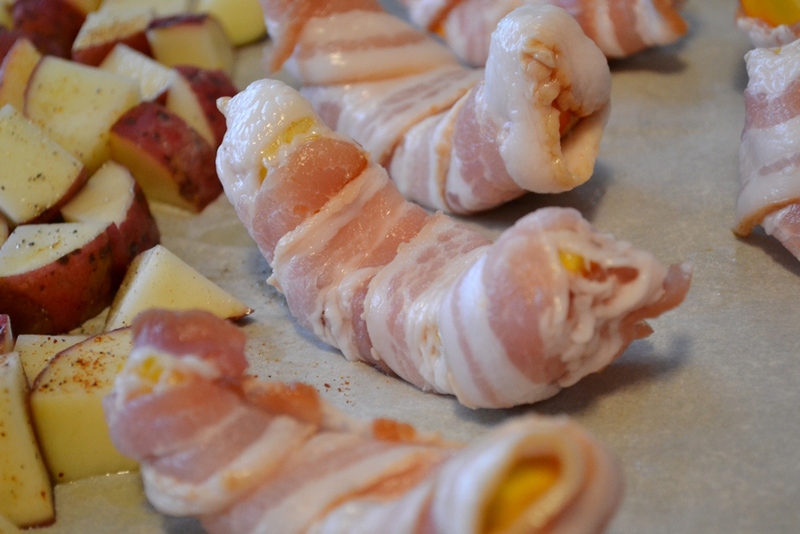 If you have any pieces not covered in bacon, coat them lightly with oil before putting on the sheet. Bake at 180°C for about 20 to 30 min, depending on the size of everything. 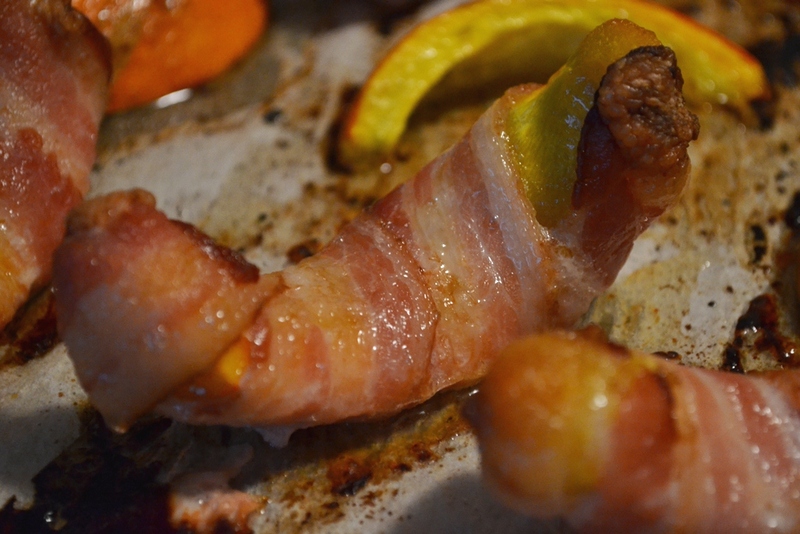 If the bacon is not quite crispy when everything seems to be done: turn on the grill for 2 min. It should crisp up the bacon nicely. You have all food group for your meal now: starch, vegetable and protein. 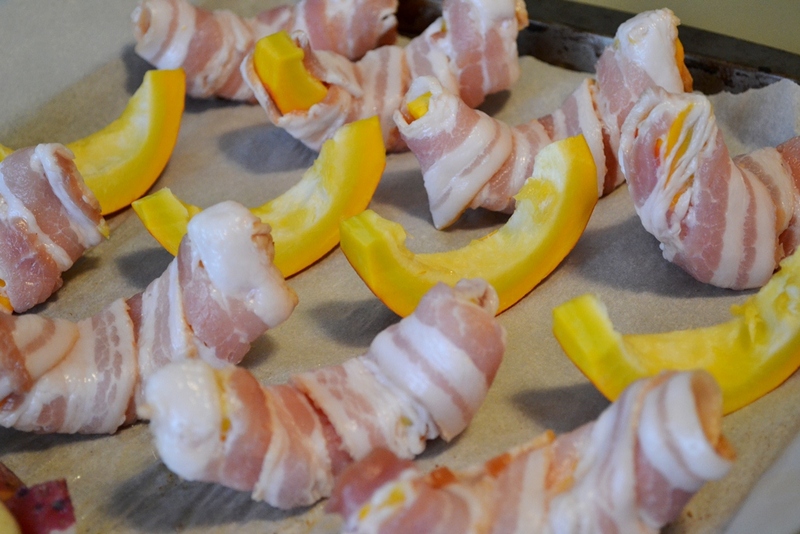 You could also add other vegetables likes carrots or have a piece of chicken that would grill with all the other things. You can also use other spices to your liking. 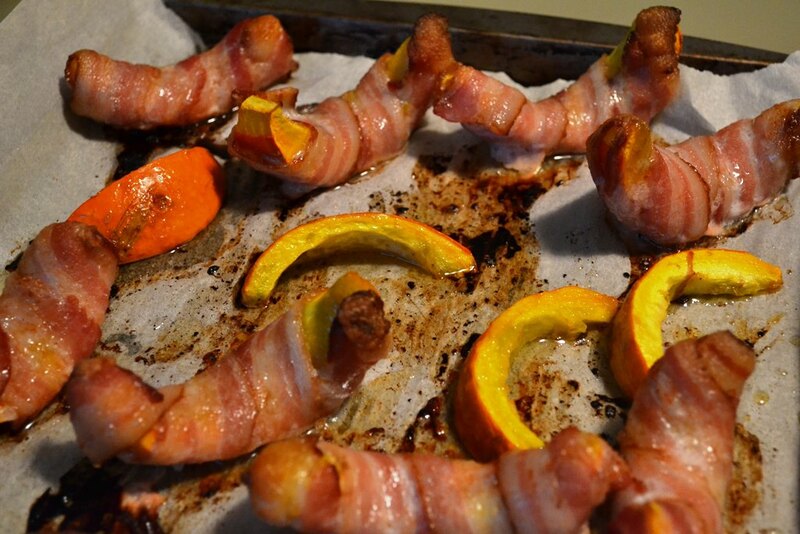 Posted in Cooking and tagged bacon, bacon wrapped, cooking, potato, pumpkin, recipe, supper. Bookmark the permalink. Sehr gute Idee, die mit dem Speck, mit Öl haben wir schon mal ausprobiert war letztes Jahr auch sehr lecker. Danke!